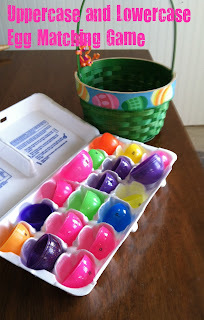 This week I am sharing some of my favorite nursery rhymes to use in the spring time and nursery rhymes to use around Easter. The nursery rhyme of the day today is Humpty Dumpty. Of course this nursery rhyme works wonderfully with the Easter theme of eggs. 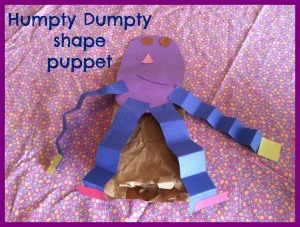 After reading the poem Humpty Dumpty, we made a Humpty dumpty puppet and retold the story. In fact, we retold the story over and over and over and over. That's just what three year olds love to do! 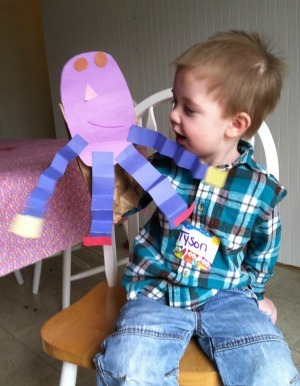 This picture was taken after we visited a preschool class so he still has his name tag. Oh yes, his name is Tyson. The boy that is-- not the puppet, his name is Humpty. Humpty dumpty is the perfect poem to accompany some of our favorite Easter activities for kids. 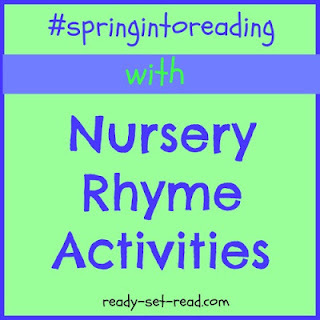 This is part of a 5 day series of Nursery Rhyme ideas and activities to use in the Spring-- or any time of the year! You can also find nursery rhyme ideas pinned to my Nursery Rhymes Pinterest board. I've been doing Nursery Rhymes and Easter in together as well, they go so well. Love your little one's Humpty Dumpty. My students are half way through doing a similar styled one. I gotta be honest, I didn't think about how well they went together until my son's preschool teacher paired them up. Once I started thinking about it, the possiblities of spring crafts and nursery rhymes are endless. I have to hand it to great preschool teachers who always inspire me! Thanks for the comment.